After finally getting to Inbox Zero, I have found that my numbers have started creeping up again. Having some sort of maintenance plan would go a long way to keeping it at zero. The first part of my maintenance plan is shown above. Just knowing how many I have outstanding in a nice concise manner is a big help. 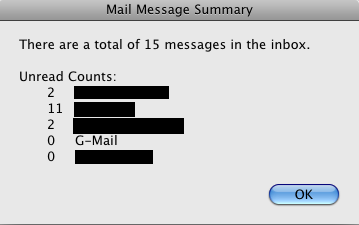 Sometimes I would rather go take care of something in the inbox rather than see the number count up. And this method does work.